This is a really good idea to do to some large eye sore’s and bring art to the communtiy. The artist’s and brothers known as Os Gemeos who also painted the brazil teams plain for the FIFA games. 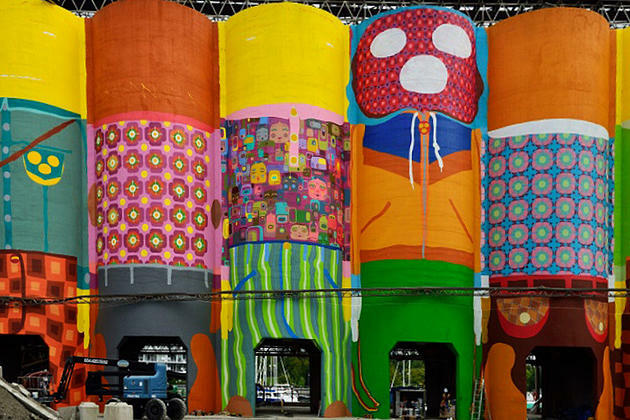 Now they went to Vancouver, Canada and painted these amazing images on the large 75 foot tall silos. These Silo’s actually Remind me of the giant wheat silos across the road from the Moda Center in Portland, OR our sister city where they paint large banners of the Portland blazers for their fans and Rip City Pride. This is a great idea that went down in Granville in Vancouver, Canada and hopefully other city’s and town’s will take a page their book and realize that they can make their area more beautiful and inspiring with just a little art. When will people finally relaize that graffiti and street art is not put there to destroy but instead to enlighten. If you want to see a 360 degree image’s of the silos being painted you can go to Hypebeast and check it out in full.